Let’s run down your checklist for an all-time holiday. Pool parties with big mobs of beautiful people? Check. Multiple-story nightclubs that don’t close until the sun says good morning? Yup. Enough gambling tables to take you to the cleaners? Absolutely. Las Vegas, Nevada, is the party animal’s Shangri-La. 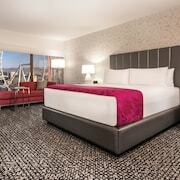 You don’t even have to leave your Las Vegas hotel to have a good time. And don’t you worry about bringing home a guilty story, because…well, you’ve heard about everything staying put in “Sin City”. 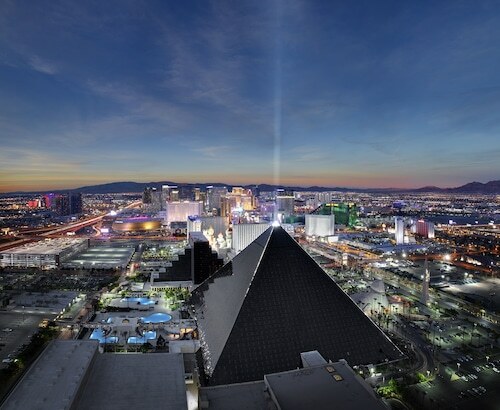 New York is known as “The City That Never Sleeps,” but we’re willing to bet that Vegas is a close number two. The amount of things to do day and night, up and down the Strip is stupefying. 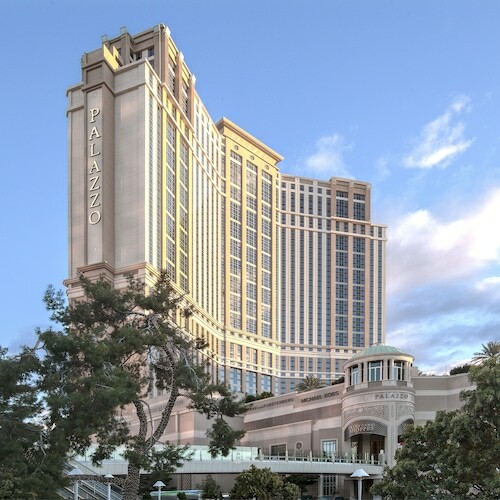 Look into accommodation near Caesar’s Palace to be centrally located to all the action along that famous boulevard. With more Five Diamond hotels than any city in the world and a world leader in the hospitality game, it’s not hard to find great accommodation in Las Vegas. Vegas’s underworld foundations are legendary, so start your trip learning about the mafia’s history in this neon landscape at the Mob Museum. Only a hop, skip and jump away from the underworld stands the Stratosphere Hotel. If you’ve got the proper-sized onions, test out the Sky Jump Las Vegas—an 829-foot decelerator descent that mimics bungee jumping. The fall is terrifying, but the view is spectacular. By the time you reach the ground, you’re going to need a drink, or maybe four. Not at some bottomed-out bar with 2-for-1 happy hour—oh no, no, no. Head downtown and hopefully you’re lucky enough slip into an exclusive, Prohibition-style speakeasy. There are only three rules: No texting, no photos and no PDA. That’s what your room at the hotel in Las Vegas is for. Almost all major air traffic flying into the valley will land at McCarran International Airport (LAS), only 5 km from the insanity of The Strip and smashing Las Vegas accommodation. The best modes of transportation for getting around town is taxi cabs and the RTC Transit bus service, but the close proximity of the resorts make walking the preferred option for travel. There’s also plenty of car hire selection available if your number one pet peeve is public transportation. When you’re “The King” you get your own festival. You just do. Head to the desert in mid-March and join the party at the Las Vegas Elvis Festival, a three-day tribute to the legendary rocker. The world’s top Elvis Tribute Artists compete for a massive cash prize. Just when you thought The Strip couldn’t have any more impersonators, this awesome event comes along. If you haven’t fully grown up yet, book Las Vegas holidays in the middle of August and pay a visit to the Super Toy Con 2016. You’ll mingle with stormtroopers, X-Men and a Superman or two. There are also plenty of celebrities who take the stage to promote upcoming projects and movies. You may even get a sneak peek at a few of those flicks if you’re lucky. 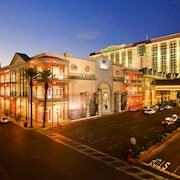 The convention takes place at one of the better places to stay in Las Vegas, so book now. The sun always shines here, so take advantage of it. Head about 25km outside of the city and go for a hike in Red Rock Canyon National Conservation Area. You’ll feel like an astronaut on Mars when you’re climbing around the red rock formations. That is until a pack of wild burros walk up on you hee-ing and haw-ing like Eeyore from Winnie-the-Pooh. There’s also a desert tortoise known as Mojave Max that lives in the park. He’s a local celebrity. Sure, there are rock formations and canyons surrounding Vegas, but those are bush league compared to what lies 400km east. Book a spot on a Grand Canyon West Rim tour and have your mind blown by the biggest crack in the earth you’ll ever see. There’s a lookout balcony with a glass bottom that’ll scare the daylights out of any normal person. We’re getting the heebie-jeebies just thinking about it. Sometimes one day in Las Vegas is all you need. If that’s the case with you, take a walk along the Fremont Street Experience. You can go for a ride down the Slotzilla Zip Line, trip out on the Viva Vision LED light show and sample some of the best food in Las Vegas. Do you feel lucky, punk? 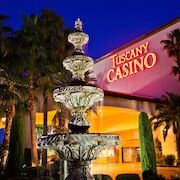 If you do, head into 4 Queens Casino and see if you can win a life-changing amount of money. Remember to always split aces. Once you’ve won enough cash, check out where some of the town’s most famous signs go to retire. The Neon Museum is home to such icons like the original Stardust emblem, the horse and rider from the Hacienda Resort, and signage from the Moulin Rouge Hotel. There are hundreds more in the boneyard, but it’s up to you to see them for yourself. Finally, before you gather your dignity and hightail it out of town, you’ve got to take in a water show courtesy of the Bellagio Fountains. The massive spouts of water are carefully choreographed to songs like “God Bless the USA”, “My Heart Will Go On”, and “Viva Las Vegas”. And you thought you’d get out of here without hearing that last song? Wotif wants nothing more than to help you get from Point A (Australia) to Point V (Vegas). 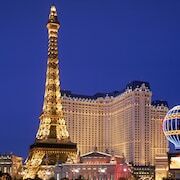 Search through our list of great deals on flights to Las Vegas and go off like a frog in a sock in Sin City. 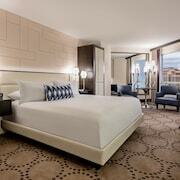 Hotels in Las Vegas start at AU$26 per night. Prices and availability subject to change. Additional terms may apply. Good location, quite room. Beds are small tho. Free parking is a blessing. Nice swimming pool, with a bar in the middle. Not too many crazy people around.